We have a huge selection of saddlebags designed specifically for Suzuki motorcycles, especially the ever popular Boulevard C50 VL800 Volusia. 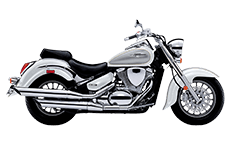 For riders accustomed to this road warrior, it's timeless beauty can be greatly affected by the wrong saddlebag choice. Fortunately for you, we have the Viking Bags collection available for every rider and every purpose. Step inside and see what it means to ride with the best. We know you'll be satisfied with every selection here. If you're having doubts or just can't seem to find the right bag for your needs, feel free to give us a call. We'll not only help you find that perfect pair of saddlebags, we'll even throw in a 30-day money back guarantee so you can get better acquainted with your choice. With free mounting hardware and installation instructions, it shouldn't be too difficult for any rider to install their new Boulevard C50 VL800 Volusia saddlebags.